Renault can clip cannot program ECUs or add new keysSo, any solution of this? Definitely yes! Renault-COM Diagnostic and Programming Tool… Here you go. So, the cheaper CAN Clip For Renault Bluetooth wins! It should be a better choice for diagnosis and programming at the dealer level advanced device for Renault vehicles. It can access various electronic control units (ECU) such as engine, gearbox, ABS, Airbag / SRS. It can display identification, read and clear fault code memory, display and store measured values and perform actuator tests. OBD2 at the Renault-COM interface contains eight pieces of ISO9141 K-Line, a piece of ISO9141 L-Line, CAN-BUS and analog-measuring circuits. Since 1996, it has been required for all vehicle manufacturers to design the internal computer systems of their cars with a standard OBD II. This stands for On Board Diagnostic. Autel MaxiSys Mini MS905 has resulted in mechanics and repair shops not having to buy different scanners for different vehicles and also means that an individual can buy a scanner that can be used on any car that they have in their household. The MaxiSys MS905 is a revolutionary, ultra-mobile solution for automotive diagnostics. The MaxiSYS Mini comes with a powerful A9 quad-core processor and comprehensive OE-level vehicle coverage. The multitasking Android Operating system is capable of coding, adaptations, actuations and much more. Weighing in at only 1.5 lbs. with a crystal clear 7.9” screen, the MaxiSYS Mini helps you organize information, diagnose complex vehicle symptoms and analyze fault codes quickly, easily and efficiently. The optional connector kit (P/N: MS905-CONKIT) allows MaxiSYS Mini users to access older vehicles ABS/SRS systems that cannot be accessed through the 16-pin OBD-II DLC connector. The MaxiSYS Mini comes with the standard 16-pin OBD-II DLC connector, wireless Vehicle Communication Interface (VCI), software for Domestic, Asian, & European vehicles, and one year of FREE updates. 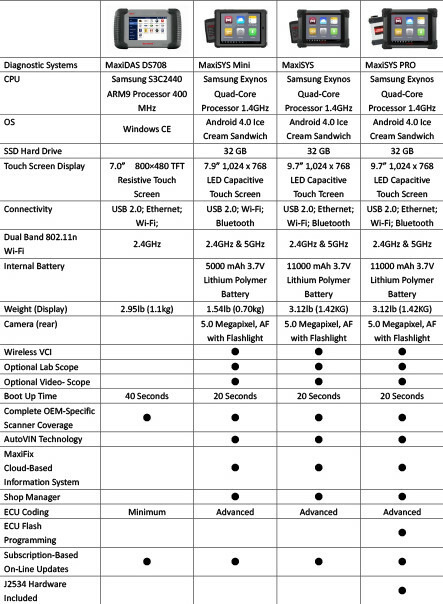 Samsung Exynos Quad-Core Processor 1.4GHz, Open source Android Operating System for fast boot-up and multitasking, Internal reliable and fast 32GB Solid State Drive for better performance, 8″ 1,024×768 LED-backlit glossy widescreen Multi Touch display with IPS technology, USB 2.0; Wi-Fi; Bluetooth. Built upon the foundation of the extremely popular MaxiDAS DS708, the revolutionary MaxiSYS Mini was built to offer all of the same qualities including a redesigned intuitive user interface (UI) paired with Autel’s advanced diagnostic software. The MaxiSYS Mini is an ultra-mobile automotive diagnostic solution complete with a powerful A9 quad-core processor and comprehensive OE-level vehicle coverage.The Autel Scan Tool Android operating system is capable of sensor initialization, coding, adaptations, and module installation and setup. Weighing in at only 1.5 lbs. with a crystal clear 7.9” capacitive LED touch screen, the MaxiSYS Mini allows the user to organize information, diagnose complex vehicle symptoms and analyze fault codes quickly, easily and efficiently. The MaxiSYS Mini includes a standard16-pin OBD-II DLC connector, wireless Vehicle Communication Interface (VCI), software for Domestic, Asian, and European vehicles, and one year of FREE technical support and updates. To keep up with the never-ending growth of vehicle manufacturers, it is imperative to bring improvements in the software to perk up the functioning of the diagnostic system. The Mini MS905 was developed with all such aspects in mind. When a diagnostic error or a new vehicle model is reported, users are presented with software updates within 48 hours that can easily download for a better diagnosis. The Autel Scanner comes enhanced with dual-band 2.4GHz & 5GHz 802.11n Wifi, which is two times faster than diagnostic systems introduced a few years back. This car diagnostic equipment is one of the fastest scanners launched in the market. It features the most advanced and the fastest A9 quad-core processor, a reliable 32GB solid-state drive and a capacitive 7.9 inch touchscreen display. The Autel MaxiSYS Mini MS905 is surely the one you must be looking for. Built on AutoVIN technology, the Autel MaxiSYS Mini MS905 identifies CAN vehicles in just one touch. Integrated with the unique AutoScan function, this tool is the smartest system developed for technicians. All functions help technicians easily detect the vehicles, diagnose selected systems and scan diagnosable ECUs on each vehicle. Built-in is a 5 MP rear camera with autofocus and virtual on-screen keyboard which adds on to the functionality of this quality piece of equipment. Autel Tools has grown to the most popular Diagnostic Company across the globe and is known for offering an easy to use and the best diagnostic solutions for all vehicle manufacturers. This vehicle diagnostic tool enables businesses to provide wide-ranging services to customers in the workshop without any prerequisite of dealer availability. 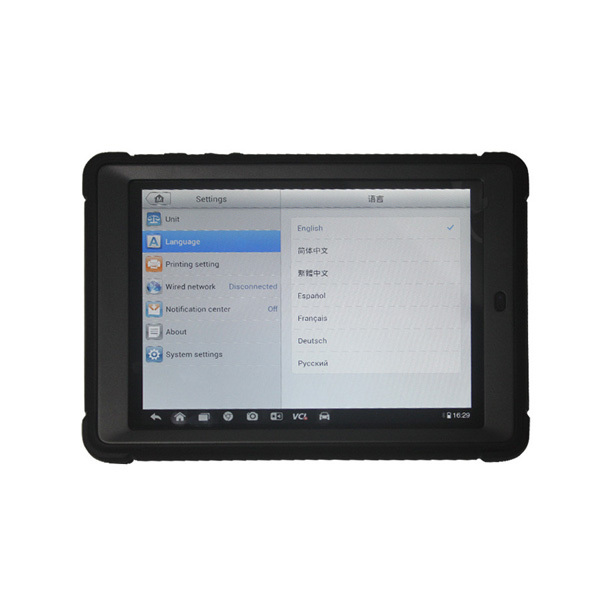 Autel maxisys mini ms905The Coding function assists technicians configuring the vehicle control modules with superfluous parameters allowing updates of the device software to latest version. The MaxiSys Mini is among the few diagnostic systems having the capability to perform reliable and secure coding at an affordable cost. As a world-shattering and ultra-mobile solution, the Autel MaxiSYS Mini serves a top-notch option to diagnose automotive vehicles. This vehicle diagnostic tool comes integrated with a Cortex-A9 quad-core processor and an all-inclusive vehicle coverage including OE level. The multitasking Android Operating System of this tool has the capability to code, adapt and actuate. With a 20 centimetres crystal clear screen and 680 grams weight, this tool can assist you diagnose complex diagnostics of vehicles, examine fault codes, and organize information more efficiently and quickly. The Autel MaxiSYS Mini kit lets users access ABS/SRS systems of older vehicles, which is otherwise inaccessible through an Obd2 scanner DLC connector of 16-pin. 1.The Vehicle Communication Interface or VCI in the MaxiSYS connects via a reliable Long Range Class I Bluetooth connection to host the tablet. On connecting the wireless VCI to the car, the technician enjoys the autonomy to fidget anywhere. With wireless connectivity, you can also update the tool to the most recent software releases. 2.The open-source Android OS gives users an opportunity to perform multiple tasks at a time with ease. The system will now boot up in just 20 seconds which is at least 5 times faster compared to other competing products. Moreover, the time required to diagnose the vehicle has also been reduced which confirms the easy start and quick performance of the device. Obd2tool.com engineers have tested the new Nissan Consult 3 iii plus v61.10 supports ECU, TCM, ABS programming with programming data Pplus V51.IF, no need extra pay for the immobiliser cards for ALL nissan since 1996 to 2016. The selection of CAN type as well as the identification of malfunction locations are completely automated, allowing CAN diagnosis to be done 17 times faster than previous method where the Consult 3 Plus system needed to be supplemented by the service manuals. Repairs involving reprogramming of the in-vehicle computer can be completed 1.5 to 2.5 times faster with the new system. Through high-speed data update system, Consult-3 Plus for Nissan is possible to update map data in approximately 20 minutes with the new CARWINGS navigation system (hard-disk) equipped in the all-new Skyline and other future products.